New Mexico State has a football team. Seriously. You can look it up. Its football team, on the other hand, has recorded 13 wins in five seasons and hasn’t reached the postseason since 1960. It was also one of the last two teams left hugging the wall of the Great Realignment Square Dance, and lost its head coach last winter to a position coaching gig in the NFL.1 Its 2013 schedule has four AQ teams on it, including Texas and UCLA. Enter Doug Martin. He was hired as the Aggies’ offensive coordinator on January 17, for his second such stint in Las Cruces, was named interim head coach on January 24 following the departure of DeWayne Walker to Jacksonville, and was introduced as the Aggies’ skipper on February 4, his 50th birthday. He does not, as far as we know, have any domesticated rodent–based nicknames. Say this for the NMSU administration: At the end of a very long tumble for their football team, they crafted as soft a landing as could be imagined for their players, who repeatedly aver that Martin was their first choice to succeed Walker. There was comfort there, after a year of zero FBS wins, the disintegration of their conference, and the abdication of their leader. Martin has been here before, both in Las Cruces itself and at the bottom of a football well. He’s had extensive experience in mid-majors, with a long stretch at East Carolina as offensive coordinator, seven seasons as the head coach of Kent State, one season as OC of NMSU in 2011, and last year as OC at Boston College.2 He knows that to assemble the kind of turnaround season his players dream of executing, another San Jose State or Utah State, a lot of things have to break his way. And to hear him tell it, all those tribulations — the coaching change, the conference scramble — are manifesting as breaks, one after another. Chief among these was a necessary increase in resources, and changes in how those resources are allocated. Martin believes the late landing in the Sun Belt will pay recruiting dividends in the near future, as he seeks to shift NMSU recruiting away from California kids and juco players and into Texas. Regular meetings with Texas State–San Marcos and UT-Arlington3 are seen as a strategic advantage. And even this year’s independent schedule, with its presumed body-bag games, is already being adroitly spun as a positive. “And they ought to have a chip on their shoulder about that,” Martin says, regarding when the team descends on Austin. “Our kids from Texas should feel like they could play at the University of Texas. And same with coaches! I tell our guys all the time, we’re in this together. Coaches ought to believe that we can coach at any level, too. We’re not sure New Mexico State will have a whole lot, tangibly, to show for this season. This is a very deep well, with straight sides and few handholds. But it’s worth remembering, as Alabama constructs waterfalls in its locker room and Steve Spurrier cruises practice sidelines in a garnet-encrusted golf cart that runs on liquid gold,4 that you’re only cheating yourselves, as consumers, if you avert your eyes from the have-nots and dismiss half your potential football intake. Watching this team, P.J. Fleck would tell you, is a chance to buy low. • Revenge is a dish best served with green chiles. You may have noticed Boston College is on the schedule this year. You may also have noticed Martin coached there last year. Is he looking forward to this game? “Well, Coach Spaz was really good to me, and he and I are really good friends, you know, so … he’s been helpful.” Martin graciously refrained from cackling at this point, but find us a person on God’s green Internet who’s not a BC alum who wouldn’t die of mirth to see them lose to New Mexico State. • Meme-ready. For the uninitiated, the Aggies have on their roster one of college football’s most coveted persons: an Aussie punter. Senior Cayle Chapman-Brown hails from Sydney, and received second-team all-WAC honors in 2012. • New Mexico State football commences: Saturday, August 31, vs. Texas in Austin. • Conference play commences: N/A for now, but the Aggies will face Louisiana’s Ragin’ Cajuns, their future conference-mates in the Sun Belt, in Lafayette on Saturday, November 2. • Required viewing: With both teams coming off horrendous seasons and operating under new head coaches, this year’s Battle of I-10 is one to watch. 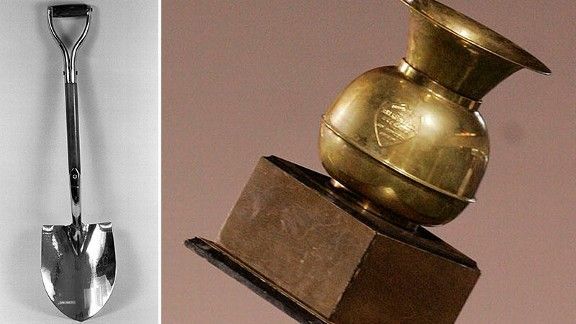 UTEP visits Las Cruces on Saturday, September 14, guaranteed to be the only game you’ll watch that day in which a spittoon is at stake. You say BC isn’t a mid-major; we say we have heart and don’t need numbers. We cannot prove this is true, but it is.